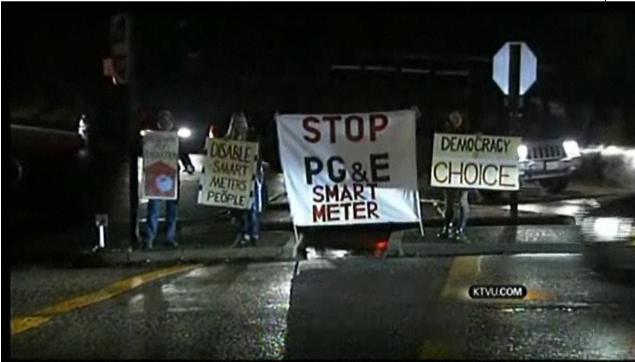 Anti- Smart Meter Protesters Greet Obama in Woodside | Stop Smart Meters! This entry was posted in Citizen rebellion, Democracy, Obama. Bookmark the permalink. I am so thankful for these protestors. Maybe it will dawn on Obama that his ideas in this case are flawed and his advisement, abysmal. Yesterday was speaking with Congressman Duncan Hunter’s staffer who told me Hunter is for self-regulation of corporations. I suggested many smart meters be installed in his own home. Susan–I wonder if Duncan Hunter thinks that self-regulation of corporations means the corporations can act like communist dictators with regard to helpless citizens? THANK YOU CALIFORNIA!!!!! We have had “smart” meters for about 2-3 years but people in New York are in such deep electronic stupors that they have no idea what is hitting them. Too many heart attacks, strokes, cancer, suicide – all within the last two years – all within a two square mile town. Can you please tell me what town you speak of? We want to research…..
Westchester County, New York. Con Edison is the electric Utility that has been putting the digital electric and gas “smart” meters on homes here. People also have “smart” water meters. I have measured the radiation in homes from the meters. Its crazy high, especially when combined with other electric equipment. The radiation from “smart” meters transmit through all electric wiring, electric equipment, wireless electric equipment and metal pipes for gas and water.